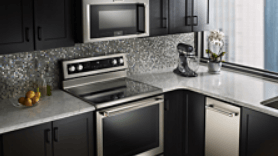 Kitchen Aid — Shop for deals on furniture, sofas, recliners, dining sets and more! A household name unlike any other, KitchenAid has been dominating the kitchen appliance market for close to 100 years. From cutlery, coffee maker, cooktops, to their iconic KitchenAid stand mixer, KitchenAid effortlessly combines fashion with function. This makes them one of the most popular brands in the kitchen. Entertain with ease using the under counter wine cellar, KitchenAid’s 24-inch wine coolers fit perfectly under any kitchen layout, looking sleek and modern. Bottle Dual Zone Wine Cellar can store white and red wines at separate temperatures. Choose between stainless steel with cast-iron grates or gas-on glass with their gas cooktops or purchase their electric cooktops for an easy to clean surface made of ceramic-glass. 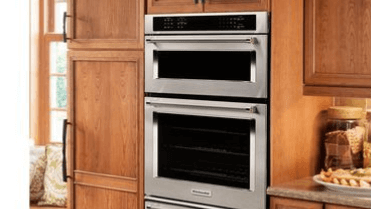 Wall ovens pair perfectly with KitchenAid cooktops and come in a variety of customizable finishes to fit the décor of any kitchen. 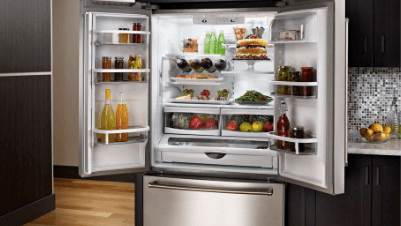 Top off your kitchen essentials with a French door fridge – two doors that open side-by-side to reveal spacious interior along with a freezer compartment located underneath. For countertop appliances, how can we leave out KitchenAid stand mixers, now with a wide range of attachments such as a dicer, slicer, shredder, juicer, sausage maker, pasta maker, and more. 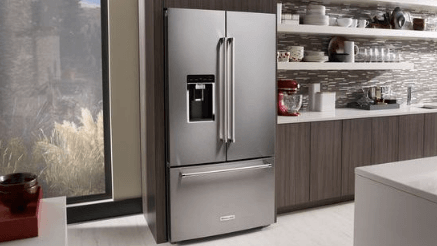 KitchenAid is always looking for ways to reinvent how you can use and optimize kitchen appliances. Don’t forget that KitchenAid also has cutting boards, cutlery, and bake ware to complete your kitchen from big appliances to small utensils.